FAQ: Are there tanks for temporary water storage for shower systems? Question: Do you offer water storage tanks for showers? I am just thinking about a friend. She has copper water lines broken in her house. My friend has no way to take a shower without putting water in milk jugs. I was wondering if the water pillows or maybe the onion tanks would be able to be implemented for this type of storage. Can they handle any type of hot water? Can I put the tank in the microwave? Also, how can I get a price quote for these tanks? I need about 100 gallons of drinking water. Answer: Thank you for contacting Portable Tanks, a division of GEI Works! We do a offer both Collapsible Tanks and Onion Tanks that can be used for your various applications. In order to get a price quote for either of these products, please provide us with your contact information (name, company name, number, email) and will we send the pricing to you. tanks can be used for this type of storage. Depending on the situation, the water bladders may contain a cam lock or threaded fitting to accommodate hoses or pipes in your location. Water bladders are typically constructed in sizes from 25 to 210,000 gallons to meet your exact showering needs. Depending on how many gallons you are looking to store, we could also see if there is some way to construct the bladder with a sling that would allow you to hang the tank down from something. This could help you control the pressure in the tank and the amount of water that comes out of the tank. 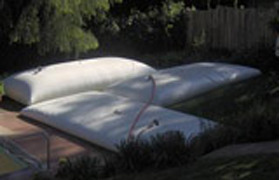 In terms of hot water, pillow tanks are typically capable of handling both hot and cold temperatures. Water storage tanks for showers can be made from several different fabrics, including ones that can handle temperatures up to 212 F. As long as the water you are looking to store in these tanks does not exceed this amount, you should be able to heat the water up in your microwave and then place it inside the tank for use.